Philadelphia boxing legend Bernard Hopkins threw some strong punches Tuesday, but not in the ring. In a "real talk" to about 60 students at the Y.A.L.E. School in Cherry Hill, he used his troubles as a youngster and his stellar boxing career to challenge them to overcome personal obstacles. "Everyone here is a champion in their own way. You have to believe that," Hopkins told the group of middle and high school students. "Fight like a champion and be a champion." World Champion boxer Bernard Hopkins pauses in a backroom before he talks to students at the Y.A.L.E. School in Cherry Hill, NJ . Hopkins said he wanted to to hit them with some knowledge. Hopkins was invited by a friend who works at the school to give a motivational speech to the students. The private school, which has campuses in Cherry Hill and Northfield, enrolls students with emotional and behavioral difficulties and learning disorders. "He has a really important message. His story is really close to home for all of our students," said school principal Andrea Damiani. Sitting on brown wooden pews in a section of the school that previously was a Catholic church sanctuary, students waited anxiously for Hopkins to enter. When a verbal altercation erupted between a few students, Hopkins quickly intervened and the students settled down to listen. "He was like a giant motivator," sixth grader Raul Galindez, 11, of Camden, said. "He had confidence in what he said." Hopkins shared his life story: growing up in Philadelphia, from the jailhouse as a teenager to light-heavyweight champ. 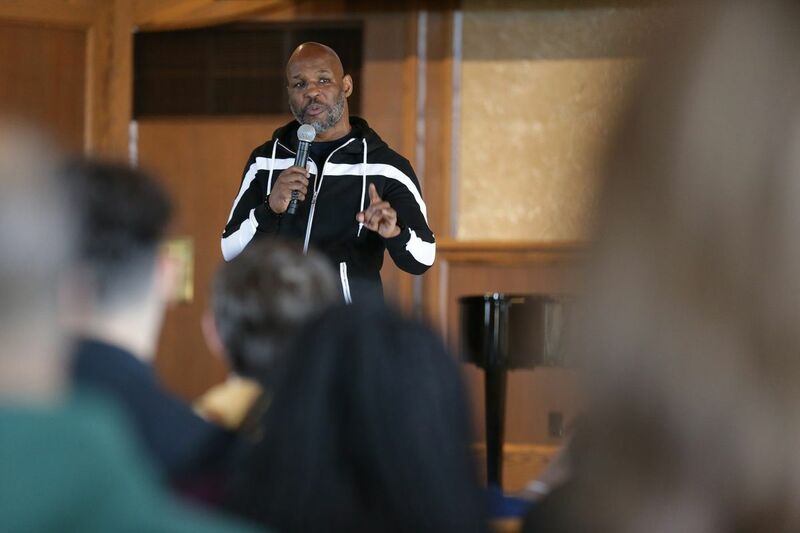 Hopkins, 53, said his biggest achievement was not in the boxing ring: It was staying out of trouble when he was released from prison in 1988 to a halfway house on Cecil B. Moore Avenue in North Philadelphia. It was then that he began a 28-year boxing career that ended in 2016 when Joe Smith Jr. stopped Hopkins with a TKO in the eighth round of their fight for the WBC international light-heavyweight crown. "The biggest thing was walking off nine years of parole without a parking ticket and I became who I became. I could never stay out of trouble," he said. He lost his first professional fight in 1988. "But I got back up." A father of two, Hopkins spoke to the students in their language, referring to himself as an O.G. (original gangster) and telling them to watch whom they select as their "homies." He drilled a theme that centered on respect for self and others. "It ain't about Bernard Hopkins," he told the students. "I'm not bragging or boasting. I'm just telling you I'm good." In his prime, Hopkins was the undisputed middleweight champion, winning a record 20 consecutive title fights. He became the oldest-ever champion when he defended his light-heavyweight belt at 49. Hopkins told the students that "there's more to life than having things: a Rolls-Royce, a big house, bling bling." Nevertheless, he has an estimated net worth of $40 million, according to Forbes. He has taken on a new role as a promoter and partner in Golden Boy Promotions. "Y'all aren't looking at a guy whose been B. Hop all my life," he said. "I was so close to not being on this stage because of decisions I made." Hopkins was sent to Graterford Prison in 1982 after a string of felonies. He was later transferred to Dallas Prison in Luzerne County because his brother's killer was sent to Graterford. Hopkins was sentenced to 18 years, but was paroled after five years. "I was in a situation even deeper than most people in this building," Hopkins said. "I clawed and dug and fought and prayed and did a lot of things to get out. I'm so glad that I didn't give up on myself and there were people who didn't give up on me." One student asked Hopkins for advice on how to cope "if you feel like everyone else has given up on you." Hopkins replied: "When they say you can't, show them you can." "He didn't speak like he was trying to tell us what to do," said Skyler Zawojski, 15, of Woodbury, a freshman. " He spoke like he was trying to help us." Boxing champ Bernard Hopkins visited the Y.A.L.E. School in Cherry Hill to give a pep talk to middle and high school students. He shows classroom assistant Vinny Marciario how to stare down an opponent. After his speech, Hopkins posed for photographs with students and faculty, signed autographs and boxing gloves that a few people had brought. Vice principal Noah McKay asked Hopkins to autograph a worn pair of brown boxing gloves that belonged to his father, who was a professional boxer decades ago. Boxing champ Bernard Hopkins and Noah McKay, a vice principal at the Y.A.L.E. School in Cherry Hill. Hopkins signed the boxing gloves that belong to McKay’s father. Hopkins said he is enjoying retirement, especially spending time with his children. He has a speaking engagement later this week with executives with a Fortune 500 company in Los Angeles. He is also working on a biography with a writer, expected to take several years, he said. "My life is cool right now," he said. " I don't have to get hit for doing nothing no more in my life in the ring."